To customize this template after signing up, choose 'Security Assessment’ as example when creating a new survey. Define the scope clearly. Security assessments are never a ‘one-size-fits’ all type of assessment. Therefore, it is very important to determine what you need to include and to which extent you want to assess those things. It is also important to note that you should make sure everyone in your assessment team agrees on the scope and its terms. Pick the right people for the job. A security assessment is no trivial task and requires a certain level of experience and responsibility so how do you know you’re picking the right people for the job. You’ll want to look at their background in security information, technical testing, governance risk compliance (GRC), antivirus, vulnerability management and more. How specialized they are is really up to you and depends on what kind of workplace you are assessing. Learn and improve. Don’t just collect the results and toss them away, put them to use and improve your workplace security. Maybe you’ll even have to set up a new security assessment to close some gaps that you’ve just discovered. Why use Survey Anyplace for your Security Assessment? Want to have a fully branded assessment? Use our white label option. Optimize communication between all your departments, automatically transfer data to over 750 apps via our Zapier integration. Improve workplace security based on the insights derived from real-time reporting! Share reports publicly or privately with all parties involved and effortlessly export to CSV, Excel or PDF. Having an internet connection when assessing security remotely isn’t always evident. Use our offline capability and you can perform security assessments anywhere, anytime! 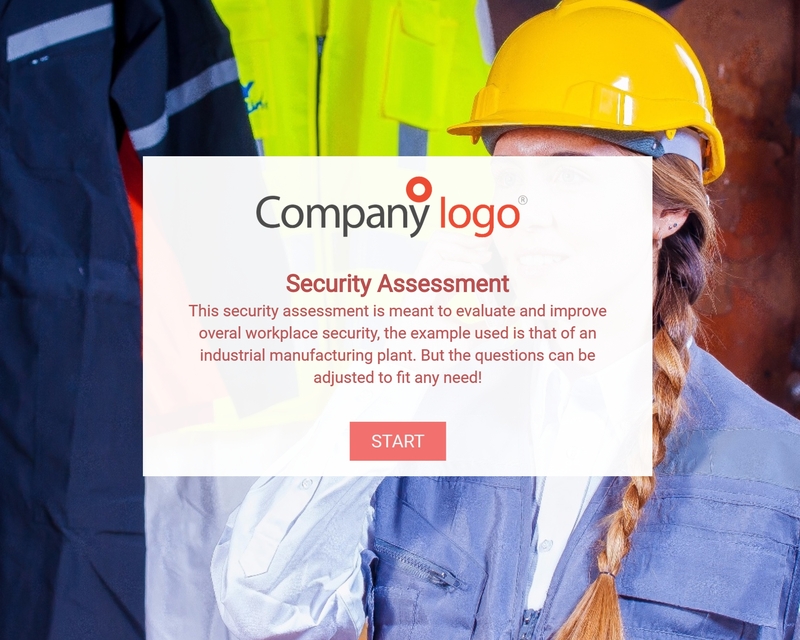 To use this sample Security Assessment Template, sign up for Survey Anyplace , and choose ‘Security Assessment’ as template when creating a new survey. It’s important that the assessment details can be recorded efficiently and that they are automatically transferred to a central system. Mobile devices such as a tablet or smartphone are ideally suited for this task. Conducting security assessments through paper forms, pdf or word documents is also possible but has the disadvantage that the data still needs to be transferred to a central system as a separate action, which is error-prone and not real-time. To take this even one step further, you can use the Zapier app to automatically transfer data between over 750 apps.